In my new role with my company I've been with for the last 16 years, I've been doing a lot of reading and thinking about goal setting. In fact, quota setting was ALL I did for the first 2 weeks on the job. Christmas is right around the corner and soon we'll start to see all the NYR's (New Year Resolutioners) at the gym but this isn't about a resolution. You see, a resolution is simply a decision to do something, it in itself doesn't have the teeth to bring achieve your goal. And there you have it...Goal. 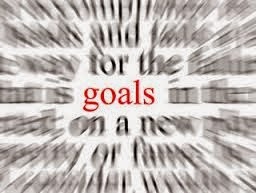 Many will say the biggest mistake in setting goals, is in not actually setting them. And while that is certainly a critical step, it's only the strategy portion of your resolution, it doesn't help you with your execution. The goal only tells you when you arrived at your destination, it doesn't tell you how to get there. My Wildly Important Goal... Drop 10 lbs by Feb 14th. The date is an important component in goal setting, as it gives you a measurement point for accountability. See righting down a goal isn't difficult, the hard part is execution; the path to the goal. I'm putting into place some lead measures, things I can do and measure that I think will get me to the goal. 1 extra day at the gym per week. 4 times / week - Bed before 11:30PM. 8 servings of water / day. Post daily to Facebook my lead measurements. Do you all care? No, but it's my blog, and I'm putting myself out there publicly to have a modicum of accountability. It worked for Elden, aka. "Fatty" from FatCyclist.com. I've not been real good about keeping my blog or Facebook current because of the new job, but we're going to start to change that NOW, which is why it's one of my lead measures. Wish me Success! Now the real reason you come to my blog... music and ride profiles.